'In Strategies of Compliance with the European Court of Human Rights, Andreas von Staden looks at the nature of human rights challenges in two enduring liberal democracies—Germany and the United Kingdom. 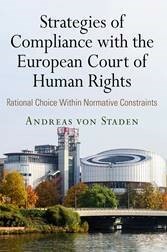 Employing an ambitious data set that covers the compliance status of all European Court of Human Rights judgments rendered until 2015, von Staden presents a cross-national overview of compliance that illustrates a strong correlation between the quality of a country's democracy and the rate at which judgments have met compliance. Tracing the impact of violations in Germany and the United Kingdom specifically, he details how governments, legislators, and domestic judges responded to the court's demands for either financial compensation or changes to laws, policies, and practices.